Purpose: To identify economic evaluation models and parameters that could be replicated or adapted to construct a generic model to assess cost-effectiveness of and prioritise a wide range of community-based oral disease prevention programmes in an Australian context. Methods: The literature search was conducted using MEDLINE, ERIC, PsycINFO, CINHAL (EBSCOhost), EMBASE (Ovid), CRD, DARE, NHSEED, HTA, all databases in the Cochrane library, Scopus and ScienceDirect databases from their inception to November 2012. Results: Thirty-three articles met the criteria for inclusion in this review (7 were Australian studies, 26 articles were international). Existing models focused primarily on dental caries. Periodontal disease, another common oral health problem, was lacking. 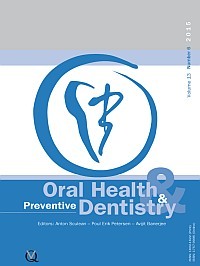 Among caries prevention studies, there was an absence of clear evidence showing continuous benefits from primary through to permanent dentition and the long-term effects of oral health promotion. Conclusion: No generic model was identified from previous studies that could be immediately adopted or adapted for our purposes of simulating and prioritising a diverse range of oral health interventions for Australian children and adolescents. Nevertheless, data sources specified in the existing Australian-based models will be useful for developing a generic model for such purposes. Purpose: To assess the correlation between self-perceived dental appearance and dental malocclusion among 18- to 20-year-old college students in Virajpet, Karnataka. Materials and Methods: A stratified random sample consisting of 280 18- to 20-year-old college students in Virajpet were recruited for the study. A pretested Oral Aesthetic Subjective Impact Scale (OASIS) and Visual Analogue Scale (VAS) were used to assess the subjects' perception of dental aesthetics. Malocclusion was clinically assessed using the Dental Aesthetic Index (DAI). The data were tabulated and analysed using SPSS version 16. The Spearman rankorder correlation coefficient was employed to determine the correlation between self-perceived dental appearance and dental malocclusion. Results: Of the 280 students, 41.8% were females and 58.2% were males. The mean OASIS score was 23.93 (± 3.72), the VAS score was 69.61 (± 15.78) and DAI 24.80 (± 6.29). Conclusion: There was a negative correlation between perception of personal dental appearance and the DAI scores in this group. El Tantawi, Maha M. A. / Abdel Aziz, Wafaa E.
Purpose: To assess the accuracy of two screening methods used by dentists in the Health Insurance Organisation in Alexandria, Egypt aiming at identifying children who need referral for treatment. Materials and Methods: The study included 45 dentists who examined 30 children using exclusively visual screening (VS) and visual screening with tongue blade (VSTB). A benchmark dentist examined the same group of children using mirror and probe (MP). VS and VSTB were compared to MP. Sensitivity (Sn), specificity (Sp), positive and negative predictive values (PPV and NPV, respectively) were calculated. The effect of dentist's gender, year of graduation and having postgraduate studies on the accuracy of the two methods was assessed. Results: VS had greater accuracy than VSTB. Both methods had a Sn and Sp >82%. The PPV of both methods was >97%, whereas that of NPV was ≤ 44%. Males and recent graduates performed better than females and senior dentists when using VS and VSTB methods. Conclusions: It is questionable whether screening using VS or VSTB can ensure effective referral of children for treatment. Further studies are needed to assess other aspects of screening, including whether referred children actually seek care and whether screening improves children's oral health. Purpose: To detect early oral premalignant lesions (OPLs) in a rural population chewing tobacco-free areca nut preparations, determine their awareness level of oral cancer and educate them about maintaining good oral health. Materials and Methods: A total of 2175 18- to 65-year-old areca nut chewers (male:female ratio 2.5:1), without a history of consuming tobacco in any form, from the villages of two districts of the West Bengal state of India were screened clinically through oral examination for suspected OPLs. A pre-designed questionnaire was employed to record demographic data, information on tobacco-free areca-nut chewing habit and knowledge about oral diseases. Education on oral health was provided through distribution of printed leaflets, display of banner/posters and a public-announcement system. Results: Chewing areca nut in the form of betel quid was more popular (90.7%) than chewing areca nut alone (9%) or tobacco-free packaged areca nut preparation sold as 'pan masala' (0.3%). OPLs were detected in 7.3% of the subjects, more among the males. An increasing incidence of OPLs could be observed with an increase in age as well as with duration and frequency of areca-nut chewing, while decreasing incidence was observed with an increase in educational level. Oral submucous fibrosis showed the highest prevalence (2.7%) among the various OPLs detected. Conclusions: Tobacco-free areca-nut chewing is an independent risk factor for the development of OPL and a large rural population still practices such high risk behaviour. In rural areas with limited health care resources, screening by visual oral examination involving minimum cost may prove useful to reduce oral cancer mortality. Toothbrushing: A Link Between Noncommunicable and Communicable Diseases? Purpose: To assess the correlation between toothbrushing (TB) and the common biological (HDL) and quality-of-life-related risk factors for noncommunicable diseases (NCDs) and communicable diseases among patients with diabetes mellitus type 2 (DM2). Materials and Methods: The present study is part of a prospective intervention study among DM2 patients (n = 200), randomly selected from the outpatient clinics, Istanbul, Turkey. The assessed variables were: TB, self-reported gingival bleeding (SRGB), HDL, BMI, body-fat proportion, modified quality of life scale (WHOQOL-BrefPhPs). Descriptive statistics, frequency distributions, Spearman rank correlation, the chi-square test and factor analysis were applied. Results: A minority of the patients brushed their teeth twice a day or more (27%) and reported no gingival bleeding (37%). Favourable HDL and high WHOQOL-BrefPhPs were 77% and 57%, respectively. A majority of patients had unhealthy BMI (83%) and body-fat proportions (63%). SRGB was negatively correlated with WHOQOL-BrefPhPs (rs = -0.24, p < 0.05) and TB (rs = -0.25, p < 0.01). The patients who reported less than daily TB were more likely to have unfavourable HDL and low WHOQOL-BrefPhPs (32% vs 54%) than those brushing their teeth daily (17% vs 35%, p < 0.05). Principal component analysis revealed two clusters: 'healthy weight' (WHOQOL-BrefPhPs, TB, BMI) and 'oral health' (SRGB, HDL). Conclusion: The present results demonstrate a correlation between TB and biological and quality-of-life-related risk markers of NCDs and communicable diseases. There seems to be a need to increase the awareness of the significance TB's potential intermediatory role between NCDs and communicable diseases. Purpose: Oral cancer presents with high mortality rates, and the likelihood of survival is remarkably better when detected early. The present study aimed to assess the awareness of general dental practitioners (GDPs) about oral screening and biopsy procedures in Udaipur, India. Materials and Methods: In this cross-sectional study, 83 GDPs were surveyed using a self-administered structured questionnaire consisting of several mandatory and optional questions. The data were analysed and frequency distribution was performed. Results: Most of the GDPs adequately performed complete oral cavity examinations and were aware of suspicious oral lesions, most common sites and risk factors for oral pre-cancer/cancer, but did not inquire about patients' tobacco/ alcohol consumption habits. Half of them referred lesions requiring biopsy to a specialist/higher centre rather than performing biopsies themselves, even after recognising the importance of biopsy as a diagnostic tool due to concerns of inadequate experience and instruments required. Varied results regarding selection of the appropriate site for biopsy and preservation of biopsied specimens were noted. Conclusion: Most of the GDPs were adequately aware of oral screening and biopsy procedures but felt reluctant to perform them, which suggests that dental education programmes are needed for GDPs in oral pre-cancer/cancer detection as well as screening and diagnostic procedures. Purpose: To determine in vitro the antibacterial properties of propolis toothpaste and mouthrinse against an in vitro multispecies biofilm model. Materials and Methods: Six-species biofilms grown anaerobically on pellicle-coated hydroxyapatite disks were fed with glucose/sucrose-supplemented medium 3 times daily for 45 min and incubated in 37°C saliva between feedings for up to 64.5 h. At each interval, biofilms were exposed to six different slurries and solutions, including: 1) toothpaste without propolis, 2) toothpaste with propolis, 3) toothpaste with chlorhexidine, 4) mouthrinse with propolis, 5) mouthrinse with chlorhexidine, 6) saline solution (control). Afterwards, biofilms were harvested and the number of colony forming units were determined (CFU). The results were analysed using ANOVA, followed by the Bonferroni test at a 5% significance level. Results: The strongest CFU reduction was shown after treatment with 0.12% chlorhexidine (p < 0.0004). When comparing the different toothpastes, there was no statistically significant difference (p < 0.05) in CFU reduction. However, they all showed a significant reduction in CFU of more than one log-step vs the saline control group. Nevertheless, the propolis-containing mouthrinse showed no significant reduction in CFU. Conclusion: All toothpastes under investigation displayed some growth inhibition in this supragingival biofilm model, which accounted for an approximately 80%-88% linear reduction. However, the propolis mouthwash had no effect. Purpose: To explore the association of maternal periodontitis with preterm delivery and low birth weight in the state of Karnataka, India. Materials and Methods: A prospective study was conducted among 340 pregnant women between 18 and 28 years of age. Subjects filled out a questionnaire and underwent a periodontal examination during the second trimester of pregnancy. The questionnaire included details regarding socioeconomic status, passive exposure to cigarette smoking, medical and reproductive history. Periodontal examination was performed according to the community periodontal index and clinical attachment loss. Logistic regression analyses were used to assess the association of periodontitis with pregnancy outcomes. Results: Of 340 subjects enrolled in the study, 33 (9.71%) were either excluded or not available for follow-up. Of the remaining 307 subjects, 126 (41.04%) had periodontitis. Among subjects with periodontitis, 15.87% had a preterm birth (PTB) and 34.25% had low birth weight (LBW) infants. In the periodontally healthy group, the rates of PTB and LBW deliveries were 9.39% and 18.78%, respectively. Logistic regression analysis showed a strong association between periodontitis and poor pregnancy outcomes after adjusting for all variables with OR 4.54 (95% CI = 1.98-5.46) for PTB, and 5.32 (95% CI = 2.01-6.79) for LBW. Conclusion: The results suggest that periodontitis is an independent risk factor for poor pregnancy outcome. Fluoride Varnishes - Is There a Correlation Between Fluoride Release and Deposition on Enamel? Purpose: Fluoride uptake of enamel after application of fluoride varnishes was compared with fluoride release into artificial saliva. The hypothesis was that fluoride uptake is higher for products exhibiting faster fluoride release. Materials and Methods: Fluoride varnishes, i.e. Fluor Protector S, Duraphat, MI Varnish, Clinpro White Varnish, Profluorid Varnish and Enamel Pro Varnish were applied on bovine enamel specimens. Subsequently, specimens were incubated in artificial saliva. After removal of the varnishes, surface bound fluoride was extracted with potassium hydroxide and measured with an ion-selective electrode. Structurally bound fluoride was etched from the same specimens with perchloric acid. Fluoride release of varnish films into artificial saliva was measured for comparison. Results: After 4 h in artificial saliva, the highest total enamel fluoride uptake of 47.9 μg F·cm² was found with Fluor Protector S, followed by Enamel Pro Varnish with 22.1 μg F·cm². The other products ranged between 12-16 μg F·cm². This was several times higher than the negative control. Fluoride uptake did not correlate with release into artificial saliva. During the first 4 h, Duraphat released the lowest and MI Varnish the highest amount of fluoride with 7.7 and 249 μg F·cm², respectively. The fluoride uptake of these two products was not statistically different. Conclusion: Enamel fluoride uptake cannot be predicted from the fluoride release rate of a product. Hence, based on the results of this study, fluoride release into artificial saliva is no measure for the efficacy of a fluoride varnish. Purpose: To evaluate caries experience in primary molars as well as the differences in caries prevalence and caries lesion location on individual tooth surfaces between first and second primary molars in pre-school children. Materials and Methods: A cross-sectional study was conducted on 307 children, aged 3 to 5 years, from randomly chosen kindergartens in Lodz, Poland. Caries experience was scored according to WHO recommendations. The caries intensity (dmft, dmfts) for first and second primary molars was calculated. In addition, the percentage of particular surfaces with caries was counted for each molar separately. Results: The mean dmft for primary molars was 1.84 (dmfts = 2.47) and dmft > 0 was seen in 53.09% of the study subjects. While in the entire examined population dmft and dmfts for first and second molars did not differ significantly, in 5-year-old children, the left mandibular first molar was associated with a higher caries intensity than the left mandibular second molar (dmfts = 0.465 vs 0.344, Z = -1.98, p = 0.04). However, in 5-year-olds, higher caries occurrence was seen for occlusal surfaces of the tooth 85 than 84 (33.62% vs 20.68%, χ2 = 4.09, p = 0.03). The distal surface was more frequently affected in first molars than in second molars in children aged 4 (85 vs 84, χ2 = 17.1, p < 0.001; 75 vs 74, χ2 = 11.5, p = 0.007, 55 vs 54; χ2 = 4.6, p = 0.03) and 5 years (54 vs 55, χ2 = 20.09; 64 vs 65, χ2 = 16.75; 74 vs 75, χ2 = 21.6; 84 vs 85, χ2 = 31.07; all comparisons p < 0.001). In contrast, the mesial surfaces of mandibular second molars demonstrated more caries than the homologous surfaces of first molars, both in 4-year-olds (85 vs 84, χ2 = 6.15, p = 0.01) and 5-year-olds (75 vs 74, χ2 = 3.9, p = 0.04). Conclusion: In 5-year-old children, caries of occlusal and mesial surfaces was more common in primary second molars. However, distal surfaces were affected more in first than second molars.